To the casual American volleyball fan, it might seem like your favorite Team USA volleyball players disappear at the end of the summer, not to be heard from again until national team competition starts up again in May. But these athletes aren’t simply taking vacations in the offseason, sipping margaritas on a tropical beach somewhere. They disperse to the far reaches of the globe to play for overseas professional teams. Although the focus of their volleyball careers may be what they accomplish while dressed in red, white and blue, these athletes go overseas to support their families and to hone their skills against some of the top talent in the world. National team outside hitter Michelle Bartsch-Hackley plays for Igor Gorgonzola Novara, which currently sits atop the Italian league standings with a 12-3 record and 37 total points. Her teammates include Team USA setter Lauren Carlini, Netherlands star outside hitter Celeste Plak, and Paola Egonu, Italy’s 20-year-old all-star opposite who set a new scoring record for at the World Championships last summer with 324 total points. 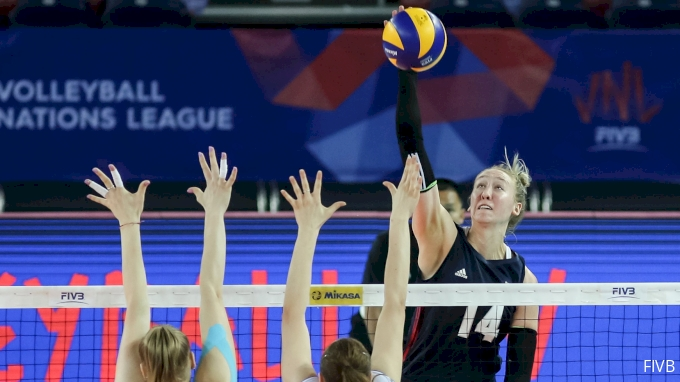 Bartsch-Hackley, who joined the national team in 2015 at the age of 25, has now played four seasons with Team USA, and recently earned the MVP honor at the 2018 Volleyball Nations League where the U.S. won gold. We recently caught up with Bartsch-Hackley to see how things are going in Italy. FloVolleyball: How were you feeling at the conclusion of the national team season this summer? Michelle Bartsch-Hackley: The national team summer was really long. There were a lot of firsts for our team and myself. We all learned a lot and we are eager to start completing together again. Flo: It’s your first season at Novara, how does it compare to other professional teams you’ve play on? MBH: Novara is a club that is very well organized and they expect us to be winning. I’m playing next to some of the best players in the world. This is my first season with such high expectations at this level. It is a really exciting challenge for me. Flo: What makes the Italian league special compared to others around the world? MBH: The Italian league is highly respected for many reasons; it has a huge fan following and the level of volleyball is high from the top of the league through the bottom. Italy is also well known for easy living and great food, so it quickly becomes one of the best and most enjoyable places to play in the world. Flo: Tell me about your team this year. Who are the big personalities? The crowd favorites? MBH: Playing in Italy, everyone knows the Italian players the most. Paola Egonu and Cristina Chirichella are both current Italian national team players. Francesca Piccinini is an Italian volleyball legend who just turned 40 years old and has been to four Olympic Games. Everyone loves her and for good reason. Flo: What makes this Novara team so good? MBH: I think we have a lot of offensive weapons from every position, and when we get into a rhythm we are unstoppable. Our passing has also been really stable, which allows us to get on a roll pretty early in matches. Flo: You have Team USA teammate Lauren Carlini on your team, what’s it like having her around? MBH: Lauren is great; she’s extremely hard working and wants to be the best. We have only played together a little bit in the USA gym before coming to Novara, so having to play with her everyday here I think will help both of us in the long run for USA. In general, having another American on the team makes the life so much easier. The cultural difference can be difficult and having someone to understand you and where you come from is so nice. Flo: What’s life like for you in Italy? MBH: I am really lucky to have my husband, Corbin, support me and drop everything to come with me. He has put my dreams at the top of his list and always believed in me. We made the decision when I first starting playing that we would do it together. He has come with me for six professional seasons now. We also have our dog, Champ, who travels with us and keeps us company. She loves to travel. Flo: What’s a typical week like for you? MBH: A typical week is a lot of volleyball. Two matches a week; normally Sundays and Wednesdays. Minimum of one practice a day, sometimes two practices. We lift at least three times a week. If we are lucky that week we get one full day off. Flo: What’s something people back home are surprised to hear about your life as a professional volleyball player overseas? MBH: Everyone is surprised at how much volleyball we play. It’s a full-time job with no off-time. I haven’t been home for Thanksgiving or Christmas in seven years. We barely have time off, and if we do, it is spent recovering for the next set of matches.